It’s Time to Rethink Rosé! When people think of rosé wine, they typically lump all wines of pink hue together and assume that rosé falls into that category. Well we are here to tell you that you can take that notion and throw it out the window. We teamed up with our local Whole Foods to find out a bit more about rosé and try to dispel its bad rap. Now we aren’t wine experts, we enjoy good wine and can tell what is a good wine or bad wine, but take our opinions with a grain of salt. Just because we love a wine doesn’t mean you will and just because we don’t enjoy one doesn’t meant that you won’t love it. We started our evening by meeting with James Richter, the wine specialist at our Whole Foods (yes, we say OUR Whole Foods because they know us at the cheese counter and the wine department). James has been working with wine for over 20 years in various areas of the wine world and is a level 1 CSW and 2nd level WSET. We love picking James’ brain about wine and even discovered Continuum because of him (we haven’t decided if this is a good thing or bad thing). He explained that most rosés are made by direct press and are not red and white wine mixed together (unless it is a sparkling rosé, but that is a different story all together). Terra Corsa Vin de Corse ($14.99, 750 Ml.) –Classic pink hues and complex aromas of red currant, peach and orange in this gem from the island of Corsica. Floral flavors mix with notes of Mediterranean herbs and citrus. Fresh pomegranate shows in the mouthwatering finish. The perfect aperitif! You can only find it here! Yalumba Rosé Sangiovese ($10.99, 750 Ml.) – With a fine ruby color, this wine has exotic aromas of raspberries, strawberries and cream and notes of lilac and violets – all with a minerally edge. The mouth feel is succulent, with strawberry, rhubarb and cinnamon flavors. Conde Valdemar Rosé ($12.99, 750 Ml.) – Tantalizing floral aromas mingle with wafts of red berries in this fruity Rosé. Zippy acidity balances nicely with graceful notes of strawberry and currant. Freshness lingers in the long finish. Perfect with crab cakes, smoked fish and Mediterranean dishes. Hard to find anywhere else! Santa Julia Innovación Rosé ($9.99, 1 Ltr.) – Intensity in the cherry-pink color hints at the bold aromas of fresh strawberries and blackberries in the glass. Nice fruitiness, wonderful balance. The light elegant finish calls for grilled fish, pizzas and charcuterie. More than 6 glasses of wine per 1-liter bottle- a great value! LOCAL pick – Domaine Turenne Provence Camille ($14.99, 750 Ml.) – From the heart of Provence, Camille is organically grown, hand picked and fermented with indigenous yeasts. Salmon in color displaying aromas of fresh strawberries, raspberries, red currants with a solid backbone and a vein of minerality. LOCAL pick – Summer Water Santa Barbara County Rosé ($17.99, 750 Ml.) – Summer in a bottle? Indeed. The light floral and strawberry bouquet makes for a wonderful transition into its flavor profile: strawberries with hints of pears and peaches, and a striking minerality. The label is quite pretty too! LOCAL pick – Domaine de la Solitude Rose Cotes du Rhone ($16.99, 750 Ml.) – This rosé has a bright pastel pink color with an intense nose of tart red berries and exotic white fruits with citrus highlights. It will be perfect for any of your parties this summer. While all of the wines were good for various reasons there were 3 that stuck out in our minds and in fact, they are the 3 that we purchased afterwards. 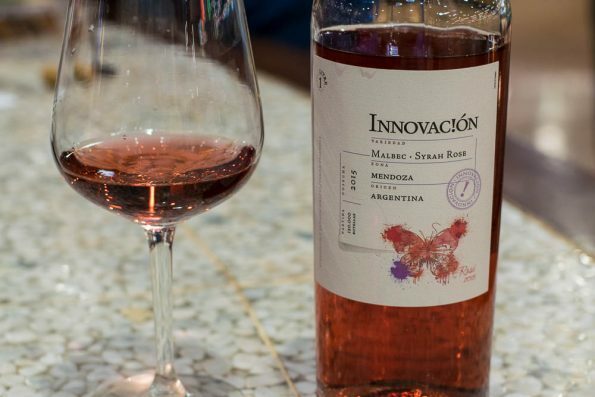 Santa Julia Innovación Rosé- This malbec/syrah blend rosé is not only a great deal at $9.99 for a liter (yes, we said a liter!) but it is also a great tasting wine. Due to the malbec grapes this wine is a bit darker than most rosés and drinks a bit more like a red. This would be a great starter rosé for someone who isn’t sure if they like them. The most prominent pairing we thought of with this wine was swordfish. Since both the rosé and swordfish are light yet bold flavor wise, they would go together perfectly. Terra Corsa Vin de Corse- This Whole Foods exclusive rosé was very citrus forward and Sarah’s favorite. It also had the most obscure varietals of the wines we tried: Niellucciu, Greache, Sciaccarellu, Vermentinu, as well as several more indigenous varieties. This was the lightest in flavor of the rosés we tried and most delicate. This will definitely be getting some attention at our summer pool parties! 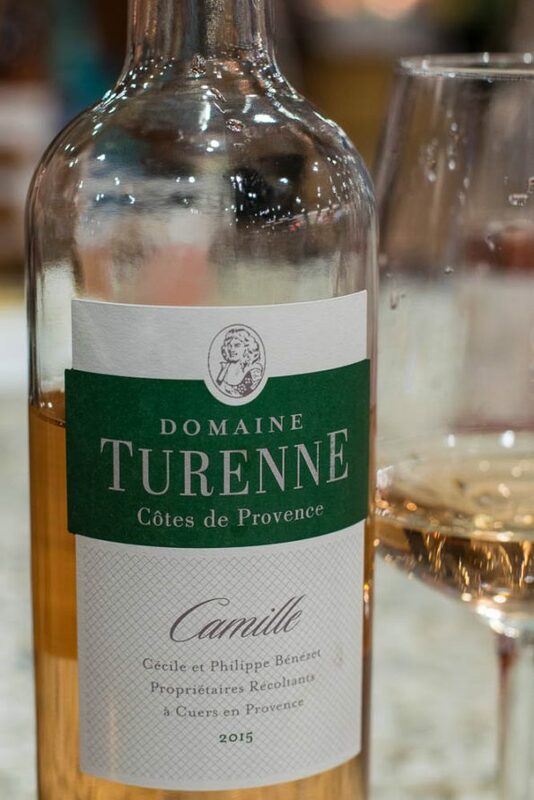 Domaine Turenne Provence Camille- This rosé hails from the most famous of rosé regions, Provence and was Matthew’s favorite. Its varietals included: Cinsault, Grenache, and Syrah. This rosé was very fruit foward yet subtle in flavor. It was exactly was you’d expect from a rosé once you learned that they are not all super sweet (we thought this going in to the tasting). 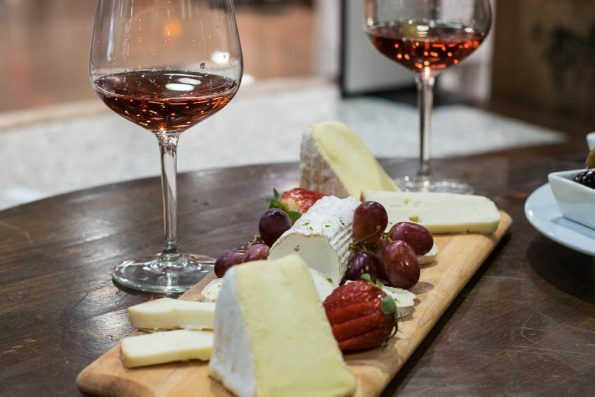 While this post is about rosé wine, we’d like to give a shout out to Whole Foods’ fantastic cheese department. We visit with them frequently and are always thrilled with how knowledgeable they are! For our tasting they put together a cheese board with: Saint Angel Triple Cream Brie (quite possibly the best triple cream brie we’ve ever had), Quadrello (one of our favorites), and Chèvre Fleurie (an amazing chèvre with a bloomy rind). We didn’t know this, but you can actually order cheese boards from them to eat at the Northside Bar or have them prepare them for you to take home! We hope we have given you some tools to rethink rosé wine (they aren’t all sweet, sugary, boozy kool-aid!). 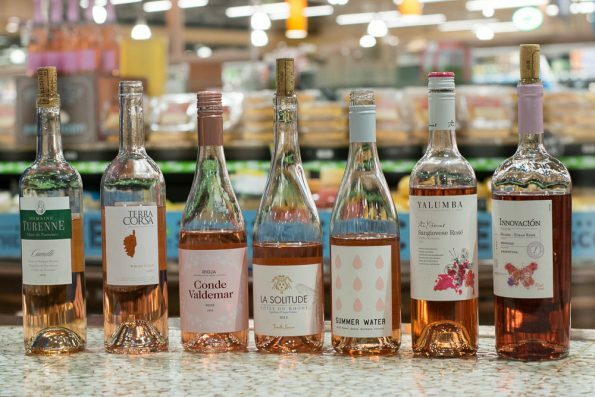 Take advantage of the La Vie En Rosé promotions going on currently at Whole Foods! It is a great opportunity to try some rosé wines at affordable prices (like we said, we ended up buying 3 bottles after our tasting)! It’s time to try the best kept secret in wine! What are your favorite rosé wines and pairings? We’d love to know! Leave a comment below or use the hashtag #GeekEats on Twitter and let us know! *The Geeks were treated to a hosted tasting in order to facilitate this write-up; opinions are wholly our own. View our Disclosure Policy for more info. That’s awesome! It made me crave some! I don’t drink it very often, but I can’t lie I do enjoy it if it’s quality. You know I’m a girly girl through and through. Even though I like my whiskey a and single malt scotches, sometimes I can’t resist a pink drink! I love that they know you by name at the cheese and wine counters!! You are the Norm of Whole Foods! Slainte!